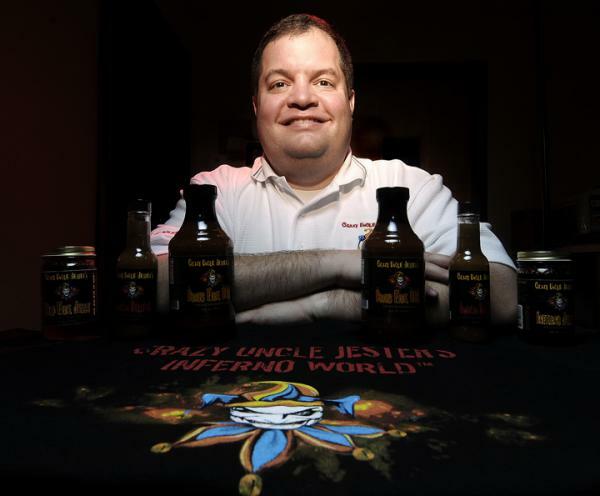 Jeffrey “Black Bull” Stevenson, President and Founder of Crazy Uncle Jester’s Inferno World and Uncle Jester's Fine Foods, was a licensed financial advisor for nearly fifteen years. In 2008, he sold his financial services business to pursue his passion for fiery foods full-time. Jeff was formally trained in Food Science at The Ohio State University, College of Food, Agriculture, and Environmental Sciences. He has a B.S. degree in Agribusiness and received his M.B.A. in Management from Wright State University. He very active with both of his families - his birth family and his Native American family, The Shawnee Nation, United Remnant Band. Jeff and Lori (Aunt Jester) were married in 1998. It was on their honey-moon that Jeff developed a taste for the flavors that became his first sauce, Jamaican HellFire. He now runs Uncle Jester's Fine Foods, a wholesale food manufacturing company that provides business incubation, foodservice packaging, custom commercial co-packing and private label manufacturing services to select clients. Jeff is active within the community and has served on the Boards of Directors for several local charities and foundations. He is a Rotary International Paul Harris Fellow, an Assistant Scoutmaster, and a member of the National Eagle Scout Association. He serves on the Board of the Shawnee Nation, United Remnant Band Education Foundation and is Financial Advisor to the Tribe.